While Charlie Hunnam‘s handsome face and blonde locks are reason enough for anyone to be watching Sons of Anarchy with unwavering interest, after watching the first five seasons, I’m struck by the way that scenes of eating express the harmony or discontent of the motorcycle club (MC). As its members seek to protect the interests of their aptly named hometown of Charming, California, as well as their families and their MC brothers against drugs, violence, and general discord, three meals mark the club’s progress. Notably, the presence and absence of these meals reflect the changing power and influence of the family matriarch, Gemma Teller-Morrow (Katey Sagal). Spoiler alert: If you haven’t yet watched the show and think you might like to, I’d suggest getting up to speed before reading further. 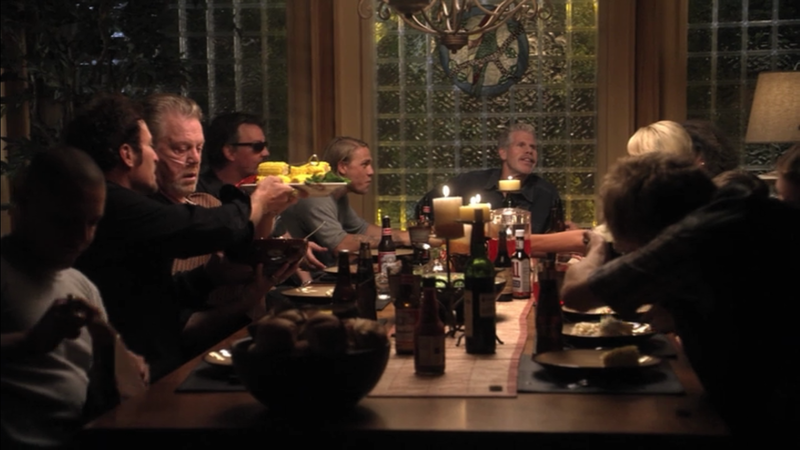 Family is a strong theme throughout Sons of Anarchy, as members of the club treat one another as brothers, willing to fight, kill, and die to protect one another and those dear to them. While these family-like ties grow apparent throughout the first episodes, they are also made crystal clear in episode two, “Seeds,” when Gemma invites the club to dinner. With equal parts motherly love and catty cunning, Gemma exerts control over others in order to support the interests of her son, Jackson “Jax” Teller (Charlie Hunnam). While her husband, Clay (Ron Pearlman), presides over the MC at the clubhouse table, Gemma rules within the home. In episode two of the first season, the club gathers around Gemma’s dining room table for a family meal. As she gathers the club around her long dining table full of dishes that she has prepared, the dining room glows with familial cheer. The camera captures the scene slightly above the height of the table, inviting the viewer in as an extra guest. Beers are sipped. Smiles are exchanged. Large serving dishes of comfort food favorites, such as mashed potatoes and corn on the cob, are passed. The club is always up against violence in their fight to keep their town and families safe, but around this table, at this moment as the camera pulls away at the end of the episode, there is peace, contentment, and conviviality. As the club’s gun running grows increasingly violent and complicated, tensions grow between members, particularly between Clay and Jax, who hopes for a different and more peaceful future for the club, one that aligns with the final writings of his deceased father, John Teller. In season 2, episode 8, “Potlatch,” Gemma aims to repair these fractured relationships by again hosting a dinner at her home. 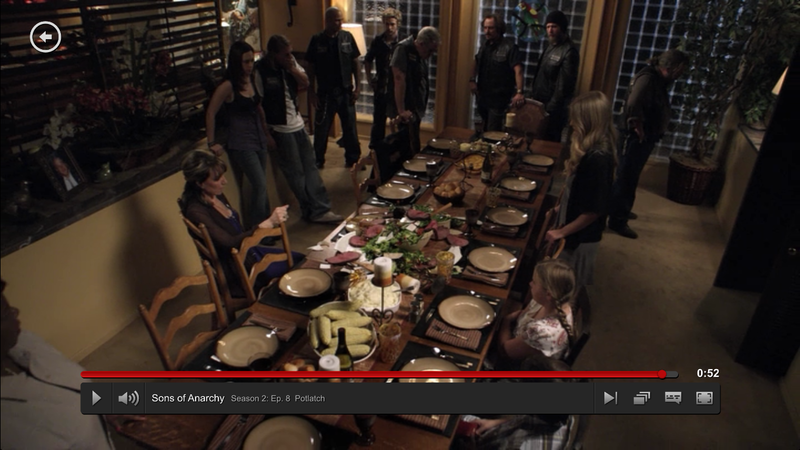 While the family meal scene from the first season of the show glows, this meal combusts, as members fight one another until Gemma forcefully slams a dish on the table, shattering it. The tense family meal mid-way through season 2 stands in stark contrast to the joyful meal in the first season. While Clay’s bang of the gavel settles club business, Gemm’s outburst truncates the fighting. The camera pulls away, displaying the broken family from above. The club’s escalating issues are portrayed spatially, as the men cluster at the end of the table, dimly lit and turned away from one another, frustrated, angry, and embarrassed. Gemma is the only one who sits, exasperated and worried. The main meat dish of the meal is scattered across the table, interspersed with pieces of the shattered dish. In stark contrast to the joyful meal in the first season, this meal visually demonstrates the growing schisms within the club’s brotherhood and the uncertainty of its future. The finale of season 3, “NS,” opens with Gemma hosting a breakfast for the MC. The meal is preceded by a scene of her cooking in the early morning hours, stirring batter as Clay embraces her. Efforts of her domestic labors are evident: baked goods cover all of the kitchen’s counter space and baking sheets and tins are piled high in the sink. Notably, Gemma hosts this meal not at her home, but at the clubhouse, demonstrating her continued maternal offerings, but a lessening of the strength of her influence, as she does not bring the club into her home. Unlike the second family meal, this third meal is again joyous, as the club celebrates not only the return of Jax’s son, Abel, and Jax and Tara’s reuniting, but also the engagement of Opie (Ryan Hurst) and Lyla (Winter Ave Zoli). 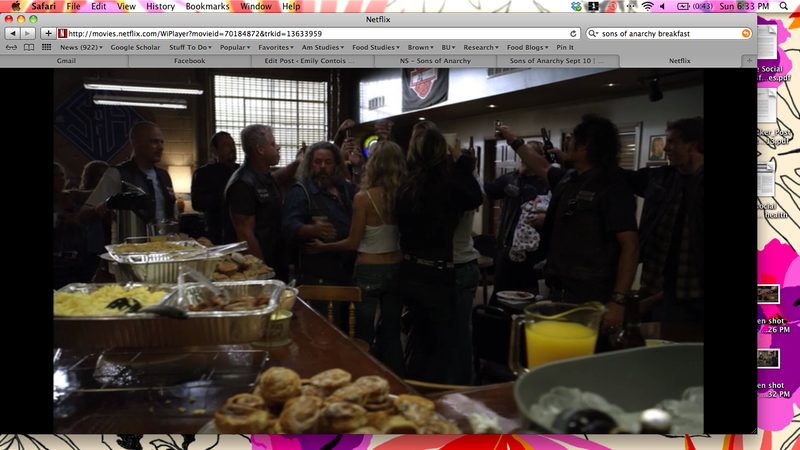 In season 3, the club toasts Opie and Lyla’s engagement over a breakfast that Gemma prepared. While Gemma connives, plots, threatens, fights, and kills for the good of the Sons, some of her contributions to the club are heavily gendered, as she mothers the members and literally feeds the club through family meals in the first few seasons. As the plot transforms, however, Gemma’s role as matriarch and its accompanying power and influence over Jax are increasingly threatened as Tara, who Jax loved when they were teenagers, returns to Charming and grows increasingly close to Jax. As Tara emerges as the leading lady in Jax’s life, Gemma not only struggles violently for her place, but also no longer feeds the club. While she is portrayed in other maternal and conventionally feminine settings—doting on her pet birds, tending to her plants and flowers, and caring for Jax and Tara’s young sons—she does not again gather the club around her table. She no longer feeds them, actions whose absence represent her waning power. We’ll have to see what happens next for Gemma, since she is once again poised to resume her role as leading matriarch, as Tara fights criminal charges, which may take her away from Jax and her sons, leaving a vacant space for Gemma to fill. The season six premiere of Sons of Anarchy airs tomorrow (Tuesday, September 10) on FX at 10 pm.